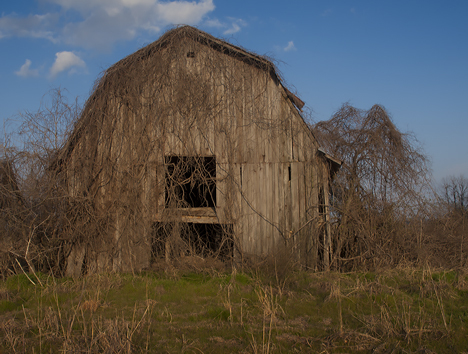 Rarely do I feature the same picture on Weekly Grist that I feature on Corndancer dot-com. 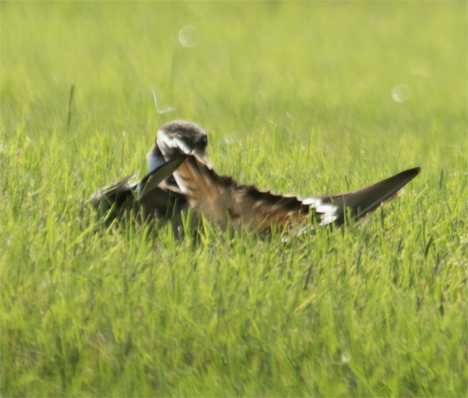 Here’s why for this occasion: This picture sets the stage for Mom and Pop Killdeer as they go into their wounded bird routine. 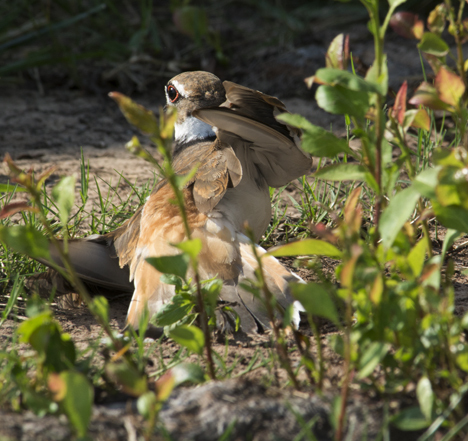 The next picture after this one was immediately after she popped off the nest and started the drama. 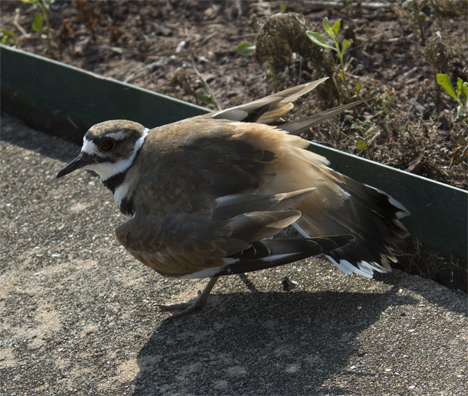 Click on Momma Killdeer to see more Killdeer pictures and a story. 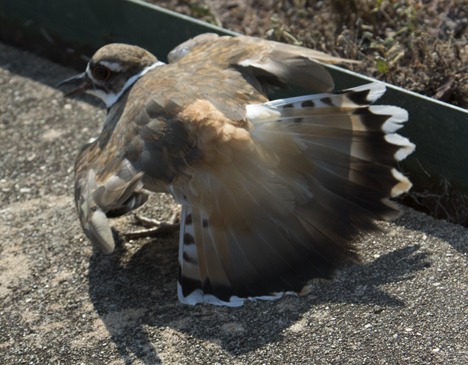 Immediately after I shot the picture above, Ms. Killdeer exited the nest premises in a public flowerbed near a sidewalk and driveway, and went into her “wounded bird, broken wing, come get me if you can routine.” A lot of birds do the same, but I’m told that Killdeer have just about perfected the perfidy. 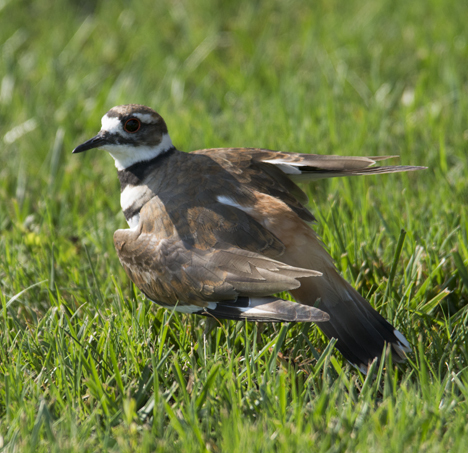 Like this one, many Killdeer nests are on the ground, so these thespian skills are a necessary instinct for survival. 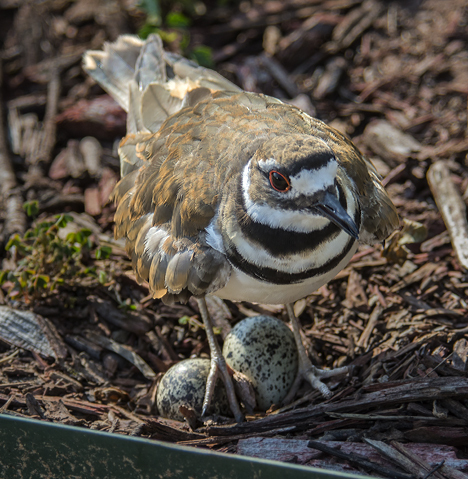 Speaking of instincts, see Momma Killdeer on her nest under extreme circumstances on the Photo of the Week page on Corndancer dot-com where this story started. 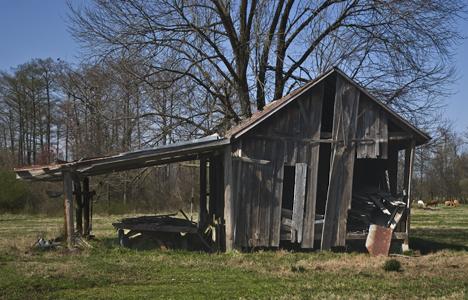 We’ll wait here while you peruse the images and soak up the story. Sometimes we tell stories with words and sometime with pictures. 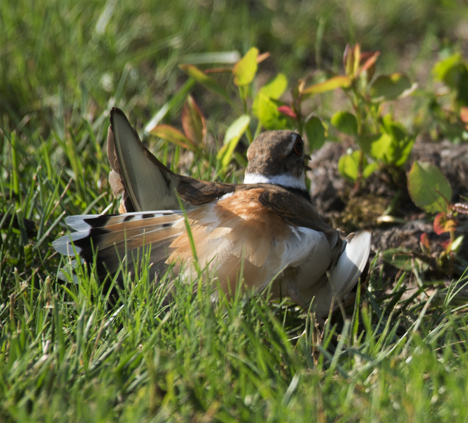 This time the pictures tell the tale as the two Killdeer put on a show to protect their unhatched offspring. 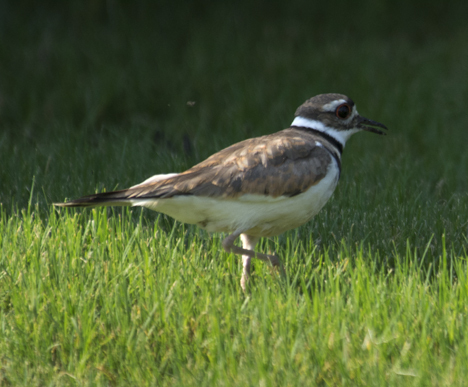 Ms. Killdeer was probably not much more than four feet away when she started to direct my attention away from her nest. “OK, now do I have your attention,” she says after making eye contact. 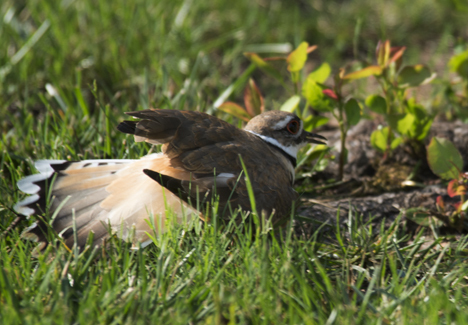 In the seconds my attention turned to the eggs, Sistah Killdeer moved to a grassy area near her flowerbed nest and checks me out to make sure I noticed. Meanwhile, about 15 yards or so away. 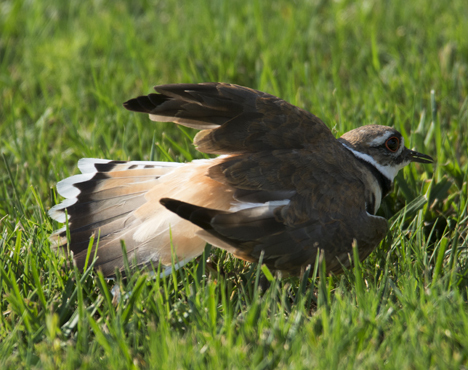 Daddy Killdeer joined the circus, wallowing around on his back. Great fakery. Not to be outdone, Mom cranks up her act again. OK, you are not chasing me. I’m gonna change directions fool! OK that’s not working, how ’bout if you chase me into this flower bed? 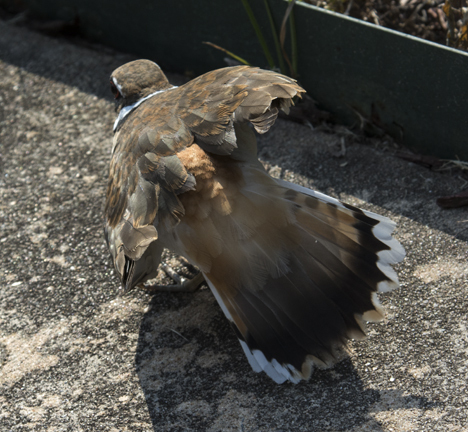 OK look at my wing now Clyde, it is really, actually broken. Come get me! Meanwhile, Pop is getting back into the act a few yards away. #@!*%!! Enough is enough! Would you PUH_LEEZE leave, split, vamoose and/or disappear? I grabbed these images late in the afternoon. 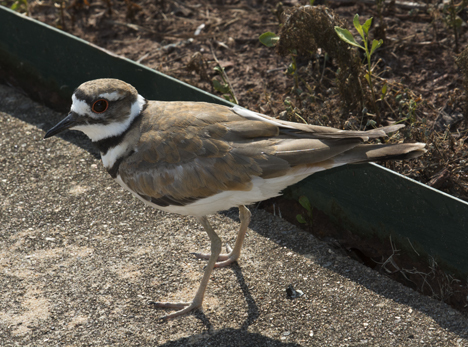 I returned an hour or so later and Mrs. Killdeer was back on the job. 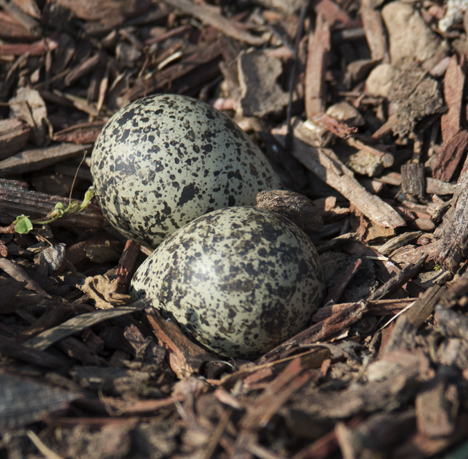 Some time in the last week or so, the hatch occurred and the nest is empty. 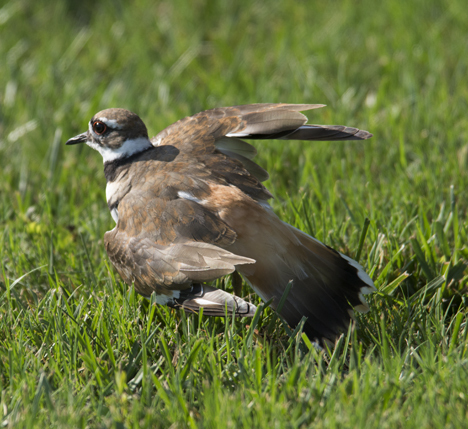 A bird enthusiast told me that baby Killdeer pretty well hit the deck running. 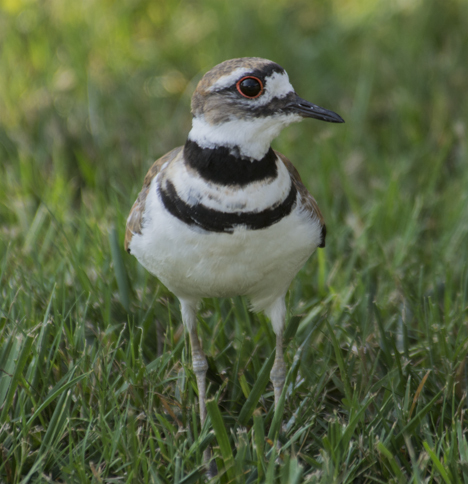 Which, I suppose is why there are still plenty of Killdeer around for us to enjoy. I wish I had been there for the blessed event, but am happy that I was able to see and record what I did. All of which continues to remind us that it is always better to be lucky than good any day of the week. The American Lotus, AKA, “water lily,” sports the largest blossom on the North American continent, its parts are edible and it looks beautiful. If a plant can be an American hero, this one is it. This particular plant is in the wild and wooly part of an otherwise reasonably civilized cypress pond. I am a firm believer in “beauty-breaks,” those moments when you stop and observe something animal, vegetable, mineral, visual, and/or audible that exudes beauty in some recognizable form or fashion and provides relief from whatsoever might be bugging you at the time. Flowers fill the bill for needed relief in almost every such instance. This time of year, for this curmudgeon, the American Lotus, AKA “water lily,” is close to the top of the pecking order to be that Balm of Gilead. Click the pic to see another American Lotus, a neat Black Eyed Susan picture – and more. I get a daily dose of American Lotus insight from a colony in a pond I routinely pass. I always look. And it is always cool. The American Lotus has kept many an American belly full when other resources were skimpy. The roots, seeds, stems — and leaves at their tenderest stage are edible. Historians tell us that some Indian tribes depended on the roots as a major source of nourishment. 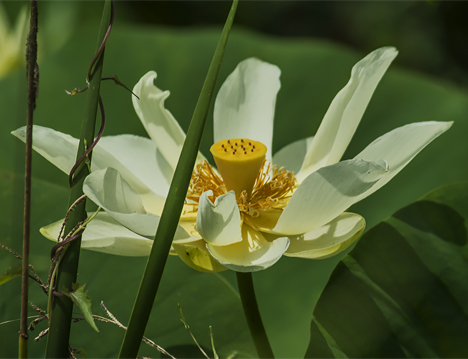 See another picture of the American Lotus and get in on how this story started on the Photo of the Week page at Corndancer dot-com. We’ll wait here while you peruse the pearls of information on that page. 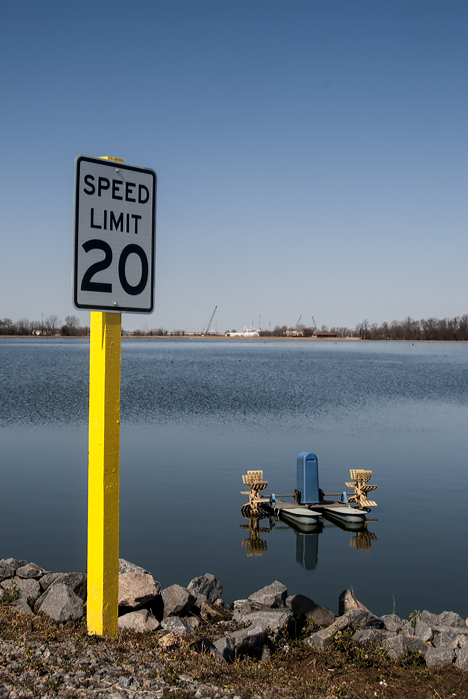 As one tools southeast on U.S. Highway 65 from Pine Bluff AR, my home stomping grounds, one will eventually pass an impoundment known as Noble Lake. Noble Lake is an ancient oxbow lake, a remnant of the days when it was a river channel. It has been a favorite resource for bank and boat anglers for years. As you look at the lake you immediately see that the majority of it is covered with beautiful white flowers with purple markings. The beauty is a nasty deception. While the flowers are visually pleasing, they are a disaster for the lake. 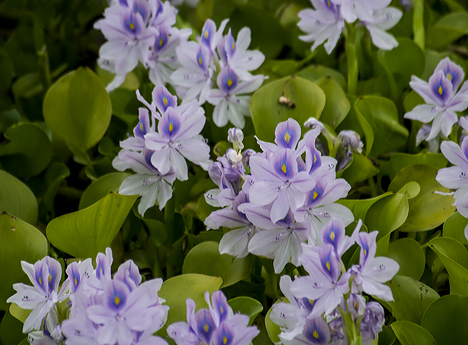 These are Water Hyacinths, an invasive and aggressive species introduced to American waters in the late 1800s. They can quickly cover an entire impoundment. At Noble Lake, these nasty critters are not far from doing just that. In the process, the thick growth of hyacinths block sunlight from native plants, and significantly diminish the supply of oxygen to fish and other aquatic creatures. These nasty plant varmints can throw Mother Nature’s balance out-of-whack in a heartbeat. A bit of lake manages to squeeze in-between the massive growth of hyacinths. Call it a natural disaster. 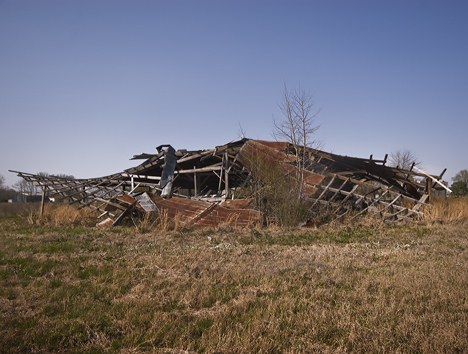 Individuals can help curb the spread of this species by making certain boats and motor cooling systems are purged of plant fragments before putting in at another location. 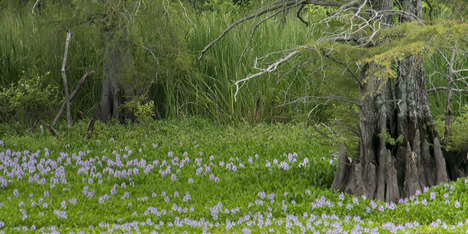 Here the rouge plants go to the banks of the lake and box in a cypress tree. 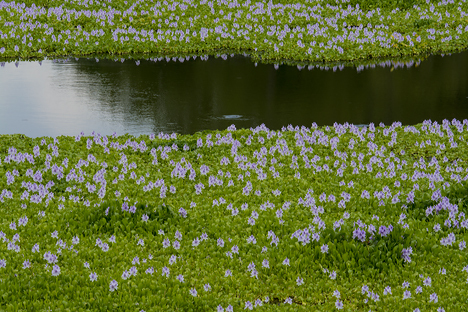 The Water Hyacinth is a prime example of how an invasive species can upset ecological balance — and while some bad circumstances at a relatively small lake may not peg many concern meters, a little here and a little there can begin to modify and environment. Look at like this, if you like the environment the way it is where you live, it is in your best interest to see than nothing tips the balance in the wrong way. The environment has a lot of moving parts. Who is to decide what’s important and what’s not? Unlike most wild critters, bugs are pretty cooperative and patient with photographers. 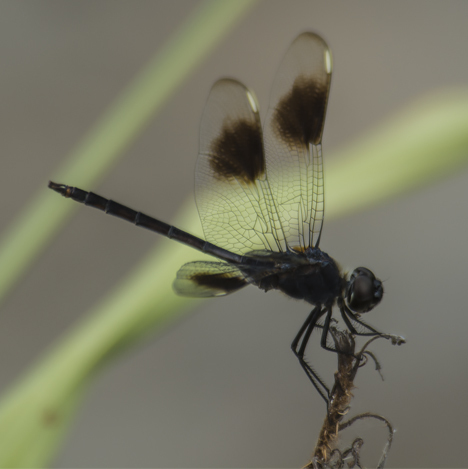 Dragonflies are among the most cooperative. This bad boy at Noble Lake stayed put while I changed lenses to get a little closer. A good dragonfly will do that. Thanks for dropping by and reading through my soapbox diatribe. While I have a great deal of respect for the environment and its denizens, I can tell you this much for sure: I have yet to fathom a reason for skeeters and ticks to exist. And chiggers ain’t far behind. Memphis blues singer Redd Velvet belts out the blues with the Jack Rowell, Jr. Band. Accompanying Velvet (from left) are: Jack Rowell, Jr., guitar; Leo Goff, bass, and Bob Horn, guitar. The event is the Blues for a Cause 2013 July 4th Concert and Benefit at the Pine Bluff/Jefferson County Regional Park in Pine Bluff, Arkansas. 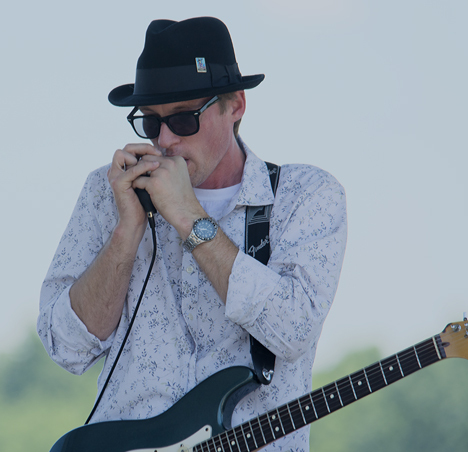 Blues for a Cause, a non-profit organization here in my hometown of Pine Bluff, Arkansas is developing a good habit of presenting a day-long blues festival and concert here on Independence Day. City commissions, associations, and local merchants throw their support behind the event which raises money to benefit families with little or no insurance who are facing huge bills due to catastrophic illnesses. 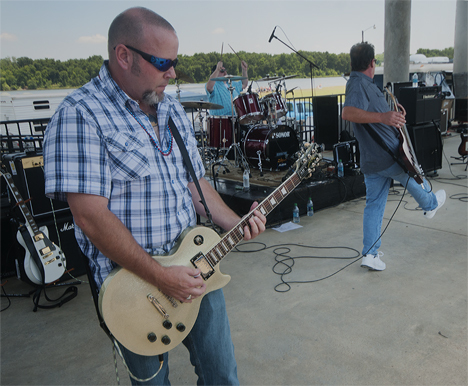 The event which started at 12:45 p.m. on July 4, featured five bands performing like a house on fire until 9:00 p.m. when the Pine Bluff Parks and Recreation Department ignited a fireworks spectacular to cap the night off in correct form. The park fronts on our slack-water harbor created by the Arkansas River so folks can take in a few rays and a dip while they listen to the blues. 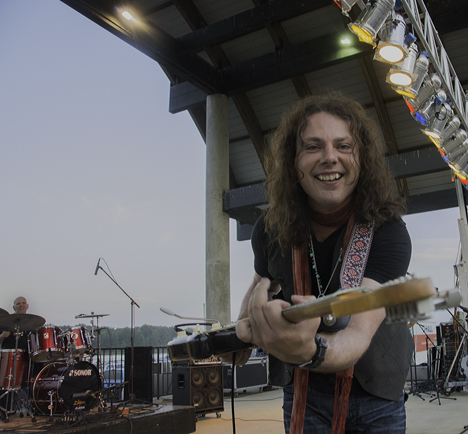 See more of the headliner act, Anthony Gomes on the Photo of the Week page at Corndancer dot-com. We’ll wait here. The headliner for the concert was the energetic, and entertaining Anthony Gomes. I was sitting on a bucket shooting his performance from the corner of the stage when he wandered over and good naturedly put his guitar in my face. We were both grinning from ear-to-ear. The drummer got a good laugh out of it as well. Fun au go-go. My guess is that you are looking at more than a century of blues performing experience here. These dudes have been there and done that. 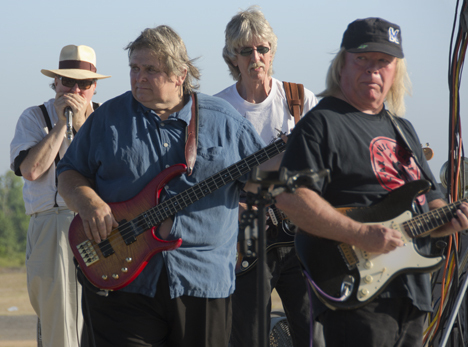 From left: Robert “Nighthawk” Tooms, harp; Leo Goff, bass; Bob Horn, guitar, and band leader and guitarist, Jack Rowell, Jr.
Guitarist Bennett South hits a final lick, while bassist Rusty Rhodes gives a lively kick and drummer Mike Parrish just finishes a big boom with a flourish as the Saints of Yesterday complete a tune. Guitarist John Hugen and vocalist/harpist Adam Varnell are off camera. Multi-tasking vocalist, and guitarist Brian Austin of the band of the same name adds “harpist” to his job description. 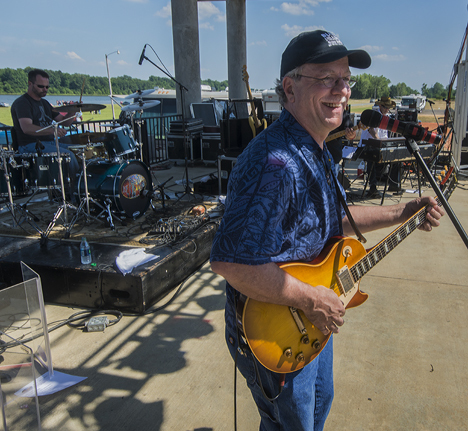 World-class band leader, guitarist, and vocalist Joe Pitts smiles as plays to an appreciative audience in his home town. 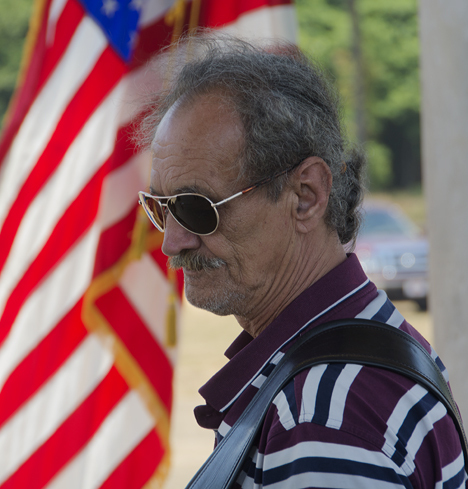 The veteran bass player with the Brian Austin Band seems pleased to be framed by Old Glory. 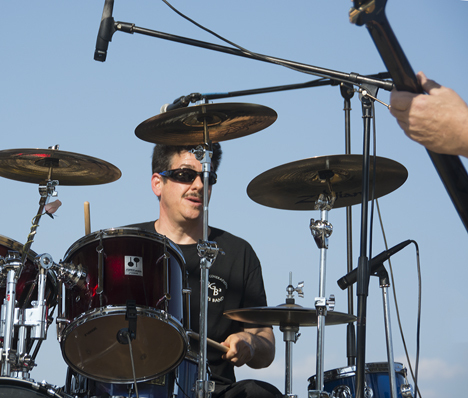 The drummer with the Jack Rowell, Jr. band looks through a jungle-gym of cymbals and drums and he provides the rhythmic foundation for everyone else. While I was shooting, a guy approached me and said he had something cool for me to shoot. 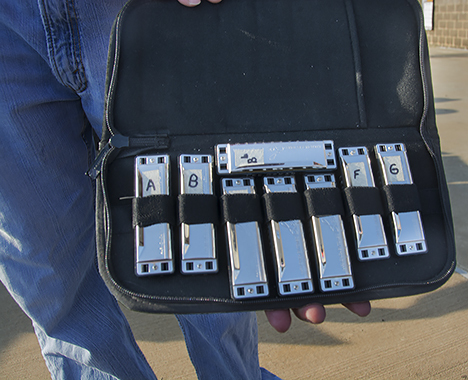 Turns out it was his fine collection of French Harps. Yep, it is cool. 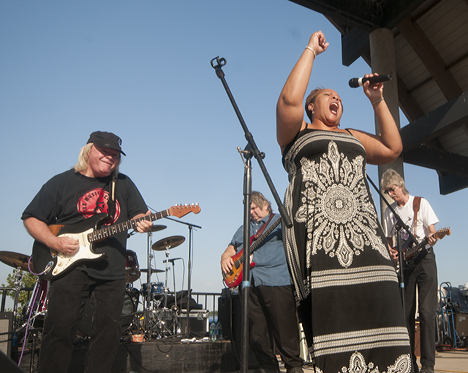 Blues for a Cause is the brain child of Joe Powell and Sandra Sallings. They put the organization together to present first-class blues concerts to raise money for families with little or no health insurance who are facing the expenses of treating a catastrophic illness. Powell and his wife, Tracey Dempsey Powell do most of the grunt work to keep the organization percolating. They are ably assisted and/or distracted by my grandchildren, Peyton Madison Dempsey and James Joseph Dempsey.